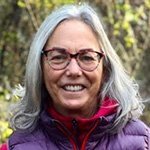 Roberta Wall, CNVC Certified Trainer based in Asheville, North Carolina, USA, has offered NVC trainings with Buddhist teachers, retreat centers and monasteries around the world. She received lay ordination from Vietnamese Zen Master Thich Nhat Hanh in 1997, was a founding member of the Zen Peacemaker Order and has studied and trained with many Buddhist teachers and practice centers. Roberta is an activist, parent, and facilitator. She offers her work in service of healing and transforming our world . Her forthcoming book, Dancing at the Intersection, is inspired by her integration of NVC with activism, contemplation and training in Buddhist, Yogic and Jewish traditions.